We conduct a textual analysis and exploit an exogenous event — Google’s 2010 surprising withdrawal from the Chinese mainland — which significantly hampered domestic investors’ ability to access foreign information. Following Google’s exit, Chinese firms’ announcements concerning their foreign transactions become more bullish in comparison to similar announcements prior to the exit and to those that involve only domestic transactions. This finding suggests that firms strategically alter their disclosure behaviors when the channel to transmit information is severed. Researchers and policymakers have long recognized the importance of a transparent information environment in capital markets. In general, corporate transparency can be achieved by encouraging market participants to produce information or by facilitating information dissemination to investors. While most of the literature focuses on the information production effort of various intermediaries including news media and financial analyses, in this paper, we study how information transmission efficiency affects corporate transparency and shapes investors’ information sets. Specifically, we use Google’s exit from China as a controlled experiment to identify and evaluate the efficiency of information dissemination, rather than production, in shaping corporate disclosure strategies. In 2006, Google officially entered the Chinese mainland market with a local search engine, Google.cn, after agreeing to abide by China’s censorship rules. Prior to 2006, the search engine market in China was monopolized by Baidu, a Google-like search engine that has been publicly traded on NASDAQ since 2005. After 2006, Google’s market share steadily increased, reaching one third of China’s market for internet searches in 2009. In comparison, as of January 2010, Baidu controlled 63 percent of China’s market share. The search engine market in China had become a duopoly. In many ways, Google and Baidu share common ground. Both focus on the internet search business and operate their own proprietary search algorithms. Both generate revenue via paid advertising platforms, provide their own webmaster and keyword analysis tools, and use geo-targeting to generate more relevant query results for users. However, the two differ significantly in that by providing internet searches globally, Google ranks the quality of the content without any bias in its search. Baidu, on the other hand, primarily serves the Chinese market and ranks Chinese language content higher. In fact, many analysts have attributed Baidu’s leading position in the Chinese market to a combination of factors, including a keen understanding of local tastes. While Google executives insist they had better technology, Baidu counters that it has local expertise. For these reasons, it has become a general consensus among Chinese web users to use Baidu to search for local (Chinese-based) information and to use Google for non-local information.  The two firms also differ in their focus on search quality. While Google ranks the quality content and inbound link quality higher compared to quantity when a search is executed, Baidu does not have a very strong quality content requirement, ranking high on both inbound link quantity and quality. Baidu also gravitates more towards a “commercial search,” allowing brands to pay a high premium to display at the top of the search results. As such, highly profitable keywords rank higher than an organic search. Lastly, by focusing primarily on the Chinese mainland market and searches in the Chinese language, Baidu lags behind Google in search quality, especially for foreign information. On January 12, 2010, Google publicly announced the discovery of a large-scale cyberattack originating from China, which occurred in late 2009, that Google believed was aimed at gathering information on Chinese human rights activists as well as plundering its intellectual property. As a result, it was “no longer willing to continue censoring” results on Google.cn and threatened to shut down its China operation. On March 23, 2010, Google began its partial withdrawal from the Chinese market by ceasing to censor internet search results as required by local law and moving its search engine for Chinese web users offshore. Internet users who typed in the search engine’s address were redirected to an office based in Hong Kong, where the local government doesn’t censor Web browsing. On March 30, 2010, searching via all Google search sites in all languages was banned in the Chinese mainland. Any attempt to search using Google resulted in a DNS error. On June 30, 2010, Google ended the automatic redirect of Google China to Google Hong Kong. Google search has continued to be blocked in China since its departure from the Chinese mainland. Figure 1 plots the change in market share between Google and Baidu during the sample period. It is evident that Google’s market share in the Chinese mainland plunged after 2010, while Baidu has seen a sharp rise in its market share. An independent source, Analysys International, estimates that Google’s market share in China dropped from 29 percent in 2010 to 5 percent in 2012 and then further to 1.7 percent in 2013. 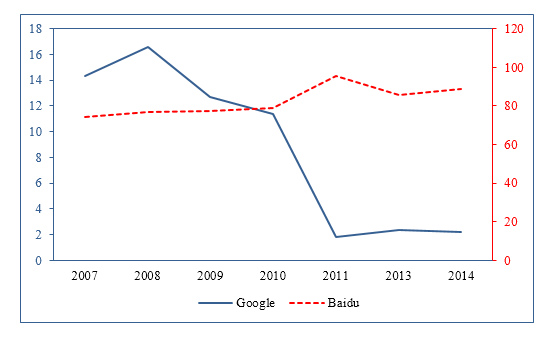 The left Y-axis is the market share of Google, and the right Y-axis is the market share of Baidu. Source: China Internet Network Information Center (CNNIC)’s Statistic Report on Internet Development in China, 2007-2014. In a market where institutions ability to access credible information is weak and limited, the termination of Google’s operation significantly hinders domestic investors’ ability to access foreign information. In order to use Google, one has to either rely on slower, costly, and often unstable virtual private networks (VPNs) or else physically travel outside the Chinese mainland. This exogenous variation in the search cost for foreign information makes it possible to study managers’ opportunistic disclosure behavior in response to the shunting of the flow of information. To explore how firms alter their disclosure strategies following a rising barrier in disseminating information in capital markets, we compile and analyze a sample of press releases issued by publicly-traded companies in the Chinese mainland. As part of the 2007 accounting reforms, the China Securities Regulatory Commission (CSRC) mandated the public disclosure by listed companies when they engage in any events it considers as “material.” We restrict our attention to such mandatory disclosures and distinguish between corporate events involving foreign transactions (such as investment in foreign countries or borrowing from foreign financiers) and those that are exclusively domestic. To capture the extent of the optimism in mandated disclosures, we measure the tone and sentiment in each corporate press release. We measure the choice of the tone level in a press release with “Tone,” calculated as the difference between the number of positive and negative words in a press release, scaled by the number of non-numerical words in the release, multiplied by 10,000. For example, a press release has 40 negative words, 25 positive words, and 9,935 neutral words. The “Tone” variable is equal to -15 for this press release. We use the HowNet Vocabulary for Sentiment Analysis in order to determine whether a word exhibits a positive or negative emotion. The higher the value, the more positive the tone is in the disclosure. Our second proxy to capture the intensity of optimism in a press release is “Sentiment.” We construct this variable as follows: we first count the number of words in a press release that belongs to one of the six sentiment categories, ranging from the strongest [“超 | over / super” (s1), “极其 | extreme / 最 | most” (s2), “很 | very” (s3), “较 | more” (s4)], slightly weak [“稍 | -ish” (s5)], and the weakest [“欠 | insufficiently” (s6)]. We calculate the difference between the sum of the words in categories s1 through s4 and the sum of the words in categories s5 and s6. We then scale the difference by the total number of non-numerical words in the release, multiplied by 1,000. A higher value for this variable indicates a more positive sentiment in the disclosure. Figure 2 illustrates the change in tone (Panel A) and sentiment (Panel B) before and after Google’s exit. Compared to the optimism in press releases about domestic events, which stay relatively flat, both the tone and sentiment measures rise significantly in press releases about foreign events following Google’s exit. This figure offers preliminary evidence consistent with the premise that firms strategically adapt their disclosure following a negative shock to investors’ information sets. We further explore the effect of Google’s exit on the optimism measures in corporate disclosures by estimating OLS regressions. In Table 1, we present the ordinary least squares estimates, beginning with a naïve correlation in Column 1 and then including a set of fixed effects and controls for various firm characteristics for subsequent columns. 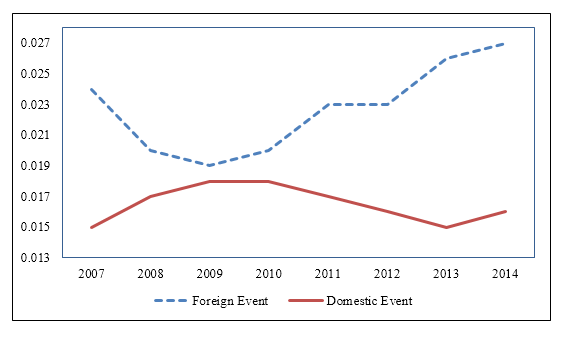 Although the parameter estimate of our variable of interest varies, we always find a positive and significant coefficient associated with the interaction term “Foreign Event” × “Google Exit.” Since the tests in Columns 3 and 6 include event type, firm, and year fixed effects, this indicates that the corporate press release issued by the same Chinese firm regarding the same type of foreign event becomes more bullish following Google’s departure from the Chinese mainland. By contrast, the corporate press release regarding the same type of domestic event becomes more pessimistic after the exit, although the decline in “Sentiment” is not statistically significant. The dependent variable is “Tone” in Columns 1 through 3 and is “Sentiment” in Columns 4 through 6. The sample period is 2007–2014. The unit of analysis is the corporate press release observations. “Google Exit” is a dummy variable equal to one if a press release is issued after March 23, 2010, when Google terminated its operations in the Chinese mainland, and zero otherwise. “Foreign Event” is a dummy variable equal to one if a press release is about material events occurring outside the Chinese mainland, and zero otherwise. The rest of the variables are detailed in Appendix A. All models include a constant and fixed effects as described in the table whose coefficients are not tabulated. T-statistics based on robust standard errors clustered at both firm and year levels are in parentheses. ***, **, and * indicate statistical significance at the 1 percent, 5percent, and 10 percent levels, respectively. 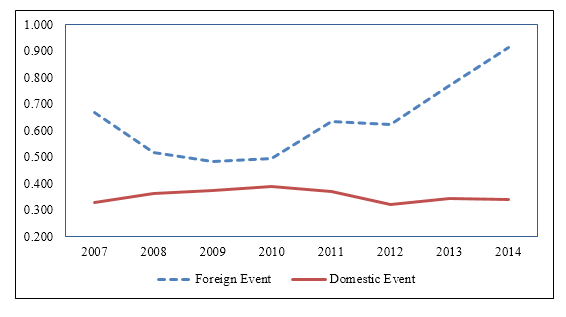 Importantly, due to the nature of the event and the content of corporate press releases we exploit, the control sample in these tests is not limited to firms that issue press releases exclusively on domestic material events, but includes also firms that have already or eventually issue releases on foreign events as well as firms that issue press releases on domestic events at different times than those of foreign events. 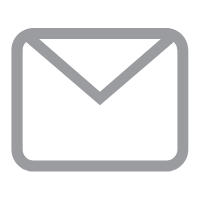 For this reason, the identification stems from the fact that the control sample includes press releases that are not affected by the Google exit and are issued at the same time as the affected press releases. Our estimates allow for a causal interpretation of the empirical evidence as long as the tone and sentiment in corporate press releases regarding foreign events do not behave differently than those concerning domestic events before Google’s exit. In the first placebo test, we randomly select a date during the sample period as the (pseudo) date for Google’s exit. We then repeat our estimations 200 times using these pseudo exit dates and compare the observed coefficients for the key variables in our baseline test with those from randomized placebo samples. In the second placebo test, we examine whether the tone and sentiment in corporate disclosures regarding a foreign event already exhibits different trends before the actual exit occurrence. 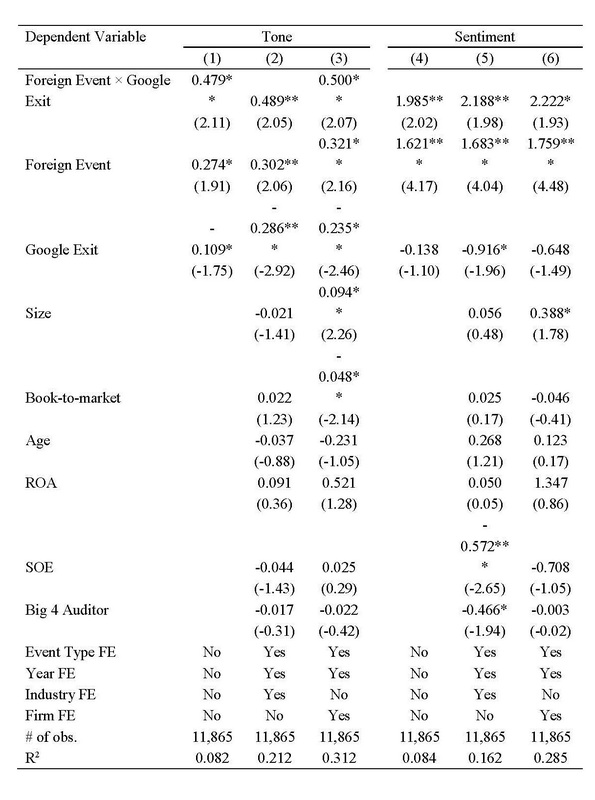 Again, we find evidence consistent with Google’s exit having an effect on the optimism in corporate disclosures only when the press release is about a foreign event. In summary, we show that Chinese domestic firms’ announcements on their foreign investments become more bullish after Google’s exit in comparison to similar announcements prior to the exit and in comparison to those that do not involve foreign investments.